The day of reckoning comes to nearly all of us. A favorite pair of jeans won’t zip up; the idea of doing any physical work is exhausting; a walk around the apartment block is enough to tire you and send you to bed. Worse, you learn you have cholesterol at a really young age or find your weight is crushing your knees. It’s the day you do not feel good about yourself and realize it’s time that you need to start exercising and get fit and healthy. Jigar Gala was sailing in this very boat but, decided to not be complacent. Instead, he worked hard to get healthy. I am 27 and I have had a very sedentary lifestyle. There was no form of physical activity whatsoever. I am an operations manager in a Public Limited company and I work from 10-6pm. I travel 12 days in a month. Diet was not right as I ate anything as and when I wanted to. I was eating cheese, butter, and fried items all the time and did not care. My water intake was low and I never ever felt energetic. Eventually, my cholesterol and Triglyceride levels also increased. Since my wife Charmi Gala is a coach with GOQii I got more intrigued about GOQii. I used to watch and hear her talk to her players giving them suggestions. She would constantly tell me how her player has improved or changed his lifestyle and got better. But, I never really bothered so much. 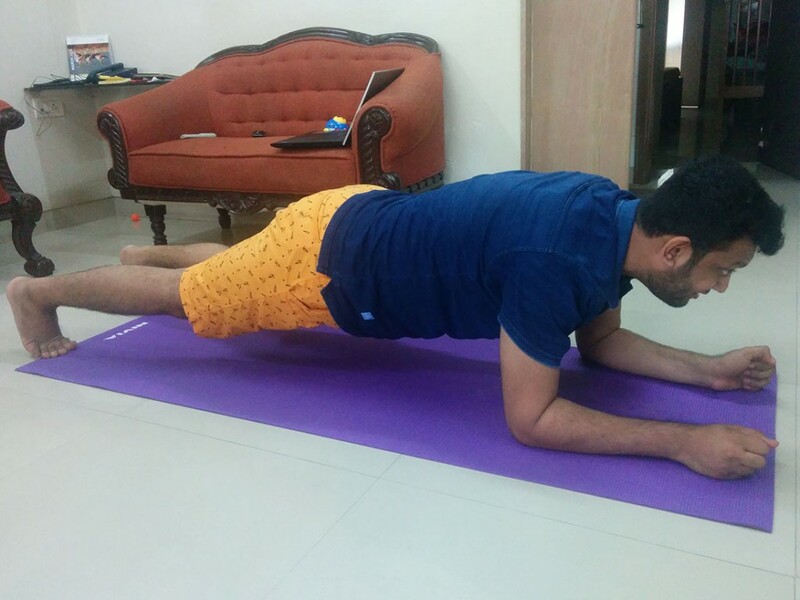 My wife suggested going in for a GOQii band so that I can discipline myself and get back on track. Six months ago I went ahead and got myself a GOQii band and said let me try it out and see if it’s working. 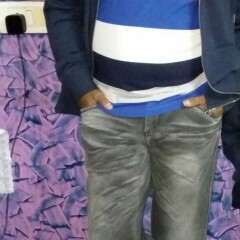 My coach is Geetika Patni. I realized that no matter what a coach tells you finally it is me who has to implement all that is being told to me in the right way and in a disciplined manner if not I would be a loser. My first health goal was to reduce my cholesterol and triglyceride levels. The doctor actually recommended medicines for the same but then I was also warned that there could be side effects of the medicines. After I have achieved the first goal I decided I will focus on how to be active and lastly lifestyle changes, increase water intake etc. Thanks to GOQii within 6 months I have been able to bring down my Cholesterol and triglyceride levels. My Cholesterol levels were high at 310 and triglycerides was at 350. Currently, my cholesterol is at 180 and triglycerides at 130. Just small changes to your diet and lifestyle coupled with discipline can do wonders to you and your health. I am extremely happy as my cholesterol is under control and my nutritional habits have changed for the better. I am not eating any junk and fried food items or anything unhealthy. I think before I eat. I have also started walking. Trying to do 10,000 steps at once seemed hard to do. But, going on a little walk in the morning, and another later in the evening helped my steps add up. I walk at a moderate pace daily for 45 minutes. Also, twice a week I do free body exercise. What I have realized over a period of time is that even if you’re someone who struggles with fitness, or if being active doesn’t come naturally to you, you can do it—and it can all be done with just walking. You don’t have to go out and kill yourself every day, just set a goal with GOQii and ease into it. 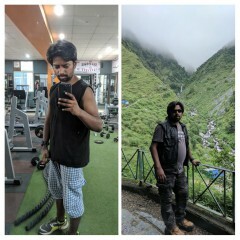 Becoming physically active has changed my attitude towards life. It has automatically helped me increase my water intake. I drink around 2.5 liters daily. Earlier was not even managing 1 liter. I have a reminder in my phone that reminds me to drink water at regular intervals. Now, I have cultivated the habit. With regard to sleep, I never had an issue. Goqii concept is really wonderful, they are creating right awareness while all other companies just want to sell products. Today people have many options out there for your health and fitness. But, what GOQii is doing is that it is creating that balance and helping change your lifestyle by making very small changes. It’s no rocket science but many of the aspects such as exercise, food, water, sleep etc we have always taken it for granted and over the years these things have affected our health. 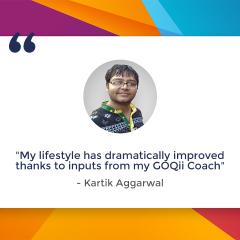 Last but not the least the coach is a motivating factor in this entire GOQii ecosystem. My wife is happy that I am following my coach’s advice. When she used to tell me to do all these things I would never take her seriously. Now I realize that what she used to tell me was for my own good. I am seeing the change in myself and she has seen me change for the better. Last but not the least, I like the karma concept that has been weaved into this ecosystem. I try to donate as much as I can. The whole idea of clocking more steps to be able to donate is a wonderful thing. My ultimate goal is to increase my immunity and lead a very long healthy life. What does Coach Geetika Patni have to say about Jigar Gala? Jigar is a very supportive player. 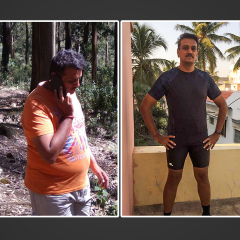 His initial goal was to control cholesterol levels, which was a bit high along with weight reduction of 10kgs. Cholesterol levels got down once he started following right nutritional practices and maintained a regular exercise routine, all of which he is still continuing and which has helped him in weight loss too. He is very curious with respect to his nutrition and adopts to all suggestions. Current workout routine includes 40 minutes of walking but, has also tried Tabata workouts in the past. He is doing very well and am sure he’ll find his perfect balance of lifestyle soon.